The 2011 report, Plastic Debris in the California Marine Ecosystem, by the California Ocean Science Trust, California Ocean Protection Council and Sea Grant found that plastic debris in the ocean not only leaches some chemical pollutants that were added during manufacture but also absorbs and accumulates others. This includes many persistent organic pollutants (so-called POPs that have been used extensively for things like pest control, crop production and industrial manufacturing) from surrounding seawater and marine sediments. These POPs have been linked to population declines, diseases and behavioral or physical abnormalities in many wildlife species. Researchers are still not sure how these chemicals, as well as others (Bisphenol A, phthalates, phenanthrene, etc.) 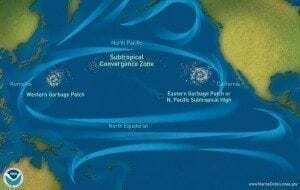 may affect marine ecosystems in the long run.